Hi, I’m Jim, and welcome to more encouragement and entertainment than you can shake a memory stick at! After a long, six-month hiatus, I’m back on the conference circuit today at the Blue Ridge Mountains Christian Writers’ Conference in Asheville, North Carolina. I can’t wait to teach a continuing session, “From Reflectig to Retailing,” and presenting a brand new keynote talk Tuesday morning on “The Creative Ten Commandments.” (I’ll post the audio ASAP.) So, this is my writers’ issue! 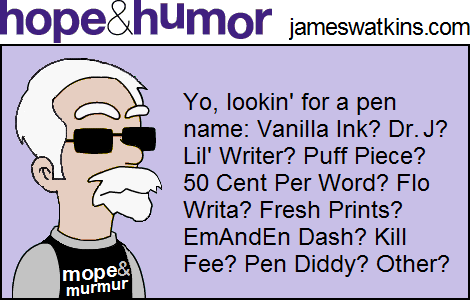 Click for more cartoons on writing. And follow my race for the White House at Watkins for President 2016. Click for more quotations on writing. And read more quotations at Why? Over 1,000 Quotations on Life’s Most Difficult Questions.